Interests - Going to school (at present she is able to around hospital visits). She loves singing, dancing and all crafts. Her favourite character is Stephanie from Lazytown but likes most other CBBC shows, particularly Peppa Pig. She likes dressing up, all things pink and princess like. We are very sad to say Katie passed away on the 23rd of September 2009. 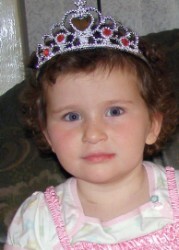 Katie was diagnosed with high risk Neuroblastoma at 15 months old. 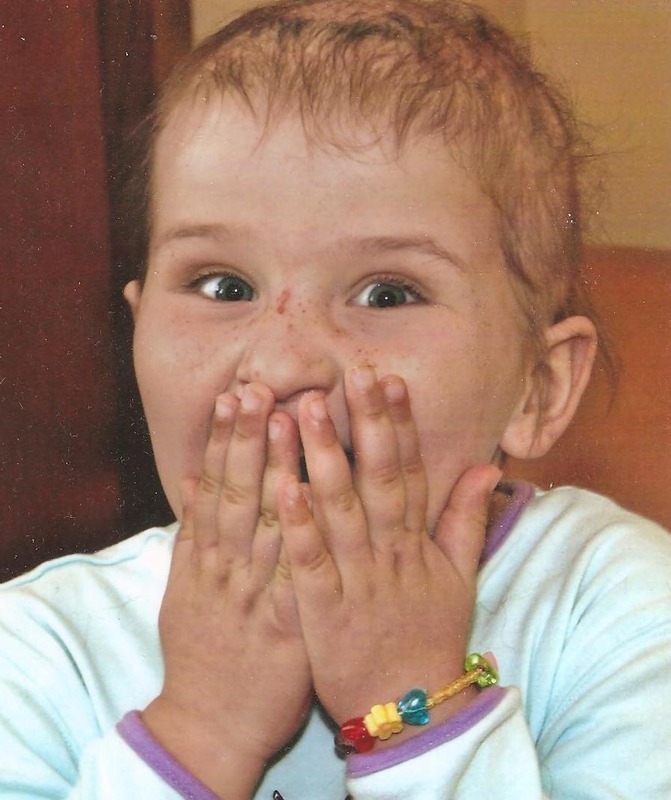 She received treatment totalling 17 months, including chemotherapy, surgery, stem cell transplant and radiotherapy. She was off treatment for 15 months until a routine scan showed that the disease had returned back to the same place, her abdominal area. She is currently undergoing further chemotherapy to hopefully make surgery to remove the tumour if possible. Despite her relapse Katie appears on the surface to be very well. She is in very good spirits and is most of the time full of fun and energy, to the point where her bald head is the only thing that indicates that there is anything wrong with her. She started ‘big school’ in September and absolutely loves it, but unfortunately her school routine is interrupted to a large extent by hospital visits. Katie is at the age where she is too young to understand anything about her condition, which I believe is a good thing. She doesn’t question why she has to go to the hospital, why she has a central line or a bald head. She enjoys the company of her two brothers, Johnny and Luke, tremendously. Katie’s brothers, Johnny and Luke, have benefitted so much from Post Pals, both before and after Katie died. I appreciate tremendously all your hard work. I would be happy for Johnny and Luke to now no longer receive post. I am aware that there are lots of families who need your help. Fortunately Johnny and Luke are managing very well and I feel that it would be better that other children receive the post instead of them. Thanks once again. Katie’s Caringbridge page has been updated, it says sadly she passed away in her sleep on the 23rd of September 2009. Sympathy cards and general post to her brothers can be sent to Katie’s usual forwarding address. Katie’s surgery has been cancelled for Thursday. Scans show that the tumour has grown significantly since the scan in July. We meet with the hospital on Tuesday to decide what happens next. I will update with any developments. Sorry for taking so long to update, but I’m sure when you’ve read this update you will no doubt understand. Katie completed her 3 rounds of oral chemo. Towards the end of the third round she became very ill, extreme vomiting, diarrhoea, weight loss and dehydration. She was admitted to hospital mid July and I thought that it was nothing specific, just a combination of 9 weeks of chemo, recent surgery, hot weather etc. At one point she was moved to isolation ward with suspected swine flu and with her being neutropenic this was a very serious issue. Tests ruled out swine flu but tested positive for an adenovirus and a para flu virus. She was treated accordingly and recovered slowly. She had an abdomen MRI which unfortunately showed that since surgery and despite oral chemo, she has new tumour growth in the same area. She has recently had a bone scan, bone marrow tests and an MIBG scan. On Friday her Consultant told me that there was a suspicious area on her 6th rib from the bone scan. However, this was shown to be nothing of concern following a chest x ray which was clear, it could have just been the result of an accident. We were delighted to hear yesterday that all her other tests came back clear and in her Consultant’s words “it looks like we are just dealing with the good old original primary tumour site”. She will have surgery on 17th September to remove as much of it as possible and what happens after that is yet to be decided. The situation is still very poor as the tumour has grown despite surgery to remove in excess of 95% in March and 9 weeks of oral chemo. Katie has had all known curative treatment in Europe. There is treatment available in America which is not available here, it comes at a cost of at least £250,000, it is not a miracle cure and I know of children who have had the treatment and have unfortunately still died. It is not even a 50% chance. We have made the joint decision that even if Katie was an eligible candidate we are not going to pursue this option. At present Katie has an amazing quality of life for which we are really grateful for. It is not the end of the road for Katie but her quality of life is just as important to us as the length of it. Surgery went well and in excess of 95% of the tumour was removed with no damage to the kidneys. Katie then started with oral chemo at home which unfortunately made her quite ill, vomiting, dehydration, total loss of appetite. The chemo was stopped not because of this but because her counts fell very quickly and need to recover before chemo can restart. She ended up in hospital to be rehydrated and given I.V anti-sickness. She is now much better and her appetite is pretty much back to normal. Before the chemo starts again she will be fitted with a PEG feeding tube which will allow me to feed her directly into her stomach when her appetite falls again and I will also be able to give her anti-sickness that way. Today she is at school being her usual happy little self, loving life and full of fun. Katie has now discovered dressing up and loves all things pink and princess like. Johnny and Luke are fine and both doing well at school. Long may this ‘normal’ life continue. Katie is in hospital having surgery. The aim of the operation is to remove as much of the tumour as possible, ideally as much as they can see. The main cause for concern is that the tumour is lying right next to her good kidney which is functioning at 75%, the other kidney functions only on 25%. The tumour encases her renal artery which is the blood supply to her good kidney. Therefore, it is a risk that she might lose her good kidney altogether and she would be left with one kidney which works at only 25%. This kidney function would not be good enough to support her body, so she would need some kind of dialysis support. Alternatively, the kidney may be unharmed, but the renal artery could be damaged. If this damage could not be repaired, they would consider removing the kidney to then put it back in at a different point (a bit like a kidney transplant but using her own kidney!). There are lots of “ifs and ands” at the moment, but regardless of the risks we feel that surgery is the only way forward at present. This is our belief, as well as that of the surgeons and Katie’s Oncology Consultant. It is anticipated that surgery will take up to ten hours and Katie will spend the first night in Intensive Care followed by the High Dependency ward then onto a normal surgical ward. Thank you to everyone for the cards Katie has received this month, I am trying to reply to each one personally. If you have not had a reply, please be assured that each item is greatly appreciated. Katie is currently feeling very well. She has scans later this week and next week with results at the end of the month. The rest of her treatment is dependant on these results, I will update her page when we get any news. I was truly overwhelmed by the volume of cards, letters and gifts that Katie and her brothers received through Post Pals in the run up to Christmas. A huge thank you to everyone. Katie, Johnny and Luke have received lots of cards and presents this month already. Katie is in hospital at the moment with a central line infection so the cards and presents have really cheered them up (especially the one from Santa’s elf confirming that they are on the “good list”).